Typically, players in a game battle for fantastical lands, important landmarks, or some other pre-determined acre of game territory. But what if the land you played for wasn’t a mere kingdom or country, but the entire Internet? That’s the basic premise of WebLords, one of two browser-based games in the works by developer Electric Bat Interactive. 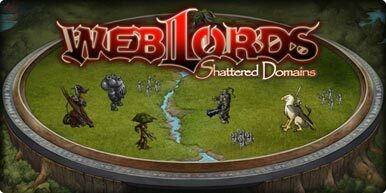 WebLords is a strategy game with role-playing elements that tasks you with battling against other players to take and hold Web sites. Any site is part of the game, and each one captured grants you ore, crystal, wood, or gold resources. With these resources, you can buy units, upgrade your character, and further strengthen your armies. The genius of the game is that it appears as a simple bar in your browser. Talking to Electric Bat’s Jonathan Hanna, it’s clear they wanted to make a game that allows people to multitask; on your computer or on your iPhone, you can surf the Web and play. If you stumble upon an unclaimed site, with a simple click you can deploy your armies to take and hold it. Not all Web sites are created equal, of course. The most popular sites will get you the most resources and will often be the most closely contested. 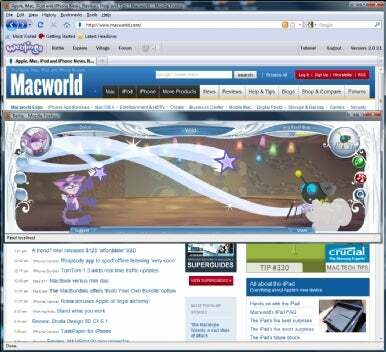 You’ll have to build up your armies and perhaps even recruit your friends to take an extremely popular Web site like Macworld.com. There’s also plenty of strategy involved. You can only capture five sites at a time, though members with a subscription can gain access to more. When you capture certain sites, you’ll be granted loot to outfit your anime-stylized character general. WebLords offers a diversity of gear and units to outfit for your armies, and each has its strengths and weaknesses. If you outfit your character with armor that increases dragon attacks and include several dragon units in your army, you’ll have a pretty one-dimensional army and will likely be defeated by a more diverse group. When you attack, you’ll want to pay attention to what units your opponent has and which ones will pose the most problem. Before battle commences, you’ll want to prioritize what units you attack first and then sit back and watch as the battle enfolds. Afterwards, you can see how your strategy faired and if you succeeded or failed in your defense or attack of a site. WebLords’ social elements are also sure to attract the attention of gamers. In addition to Facebook integration, you’ll have friend lists and the ability to ask your friends to join you in battle. The two or three of you can then decide how many troops you want to deploy to a battle and can share in the defense, attack, and resources of a site. There’s no disadvantage to calling a friend, either: while you’ll share the captured resources, your loot ultimately depends on how many troops you have. You increase your garrison, you increase your resources. From an advertiser’s perspective, WebLords presents a striking new business model. Jonathan Hanna explains that instead of a .5 percent click through, sites where WebLord battles take place have an 80 to 90 percent click through. Because players are still on the sites while battling, sites see a huge spike in hits. According to Hanna, Electric Bat Interactive is hoping to parlay this high click through rate among its users into deals with certain sites. By making a site more valuable in the game, more players will be drawn to the site as an objective. There are certain quests and items to find on certain sites for the game, and these also will increase traffic to certain websites. This free to play title will have in-game purchases as well, but Hanna assures us that “players can’t buy their way to victory.” You’ll have to strategize, build up your troops, and build up your character’s experience like anyone else. Combining strategy, RPG, casual, and social genres into one game seems like a precarious proposition, but Electric Bat seems confident in their product. They’re shooting for a summer release, and already their games have become one of the bigger stories creating buzz at GDC. While WebLords will likely appeal to a number of different gaming communities, Weblings is perfectly tuned to a young adult audience. Weblings is already live at the moment, but after talking to their users, Electric Bat Interactive decided to take the unusual step of completely overhauling the art of the game. Now hoping to relaunch in April, Weblings is a free scavenger hunt/collection game with a player versus environment focus. The game’s premise is that the Internet is sick with bugs and you and your friends must find these bugs and defeat them. 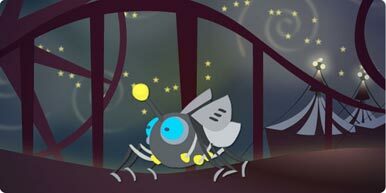 The “bugs” in this case aren’t technical errors in code, but rather cartoon mechanical menaces that you must defeat in battle with your digital pets, the Weblings. Like WebLords, you’ll be using a browser bar to log on and play. You’ll also be able to travel to different web sites, in this case in a quest to eliminate bugs and unlock more weblings. Your weblings are like Tomagachis, Pokemon, and badges combined into one. You’re trying to collect the 20-plus weblings available at launch (not counting special holiday ones that are only available after completing time sensitive quests) and then use these weblings to take out bugs. Each player will have a special home, called a Haven, for his/her favored webling. Your friends can visit your haven and see your webling and the decorations you’ve unlocked or bought for its home. There’s also a messaging system so you can keep in contact with your friends in the game. By defeating bugs, finding special bugs, and accessing web pages that are special quests for the day, you’ll be able to gain tokens. The six types of tokens available can be combined to unlock new weblings. There are seven different types of weblings that correspond to a different type of website: food, celebrity, popular, science, music, family and finally the elusive “wild” type. You’ll only have access to five weblings at a time when battling, so you’ll want a diversity of types (each has their own strengths and characteristics) and you’ll want to make sure they keep up their stamina. Weblings’ “scavenger hunt across the internet” collection game formula will likely appeal to younger or casual gamers. From an advertiser’s perspective, the game is also a great opportunity for traffic. Many weblings can only be unlocked through finding certain web pages and battling certain bugs, meaning players will be frequenting many different sites and sticking around until they’ve completed their quest. GDC is privy to some of the glitziest and most anticipated gaming news items in the business. But developers like Electric Bat Interactive prove that some of the best gems are harder to find but just as rewarding. Both games offer cross-platform performance and rare depth for browser games; they’re unique and clever formulas will hopefully give them a bit more than just a fleeting moment of spotlight in the GDC circus.